"Concatenations Series, (Four Strands #1)"
We are living in a world of technology advancing far faster than the average human can comprehend. Addressing these issues the six artists in Hello Dolly express our sense of awe at these vast complexities, explore our fears, and examine the opportunities offered for the future of our species through scientific advancement. Nate Hill creates "new animals" working with artifacts gleaned from various animals (lizards, birds, raccoons, etc.) which he morphs together and preserves in jars of alcohol. His creatures exude a "Heart of Darkness" creepiness recalling the genetic experiments gone awry on Dr. Moreau's island of monsters. Jessie Joo is also fascinated by mutations and the specter of genetic monsters. His surrealist drawings start with a blob of ink like a single cell on a petri dish and then he imagines a humanoid creature evolving from the ink creating endless variations and aberrations. Eva Lee is engrossed by nature and the ways in which we understand its scale and its structure through science, our dominant system of knowing. Her drawings investigate what she calls worlds within worlds by making associations between an imagined world of nature and the constructed world of science. Working in an intuitive manner her drawings evolve into a kind of conceptual life form that can be cellular or cosmic. 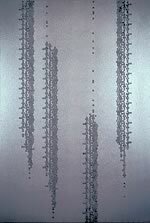 Taney Roniger's Concatenations, are panel paintings fusing patterns abstracted from advanced computer technology with forms and configurations alluding to sacred texts and symbols. This work presents a quiet tension between the apparently antithetical strivings of our technology driven culture and the mystical impulse-while at the same time asking whether there might not be a connection between them. Leah Oates' installation "Unknown Geometry" refers to the still undefined and unimagined in biological exploration. Her work examines DNA which she calls the "original replication device" addressing issues of originality and copyright that surround genetic research. 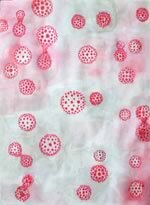 Andrea Wohl makes paintings on paper that intuitively distill her interest in the sciences, particularly molecular biology and botany, exploring and utilizing the textures, processes, and beautiful accidents of nature. The performance piece Smoke Test was written by playwright Jeffrey M. Jones who also has a background in computer programming. Smoke Test will be performed on opening night of the exhibition by Henry Mandell, visual artist and robotic performer, and SICO the robot from International Robotics, INC. Says Mandell, "SICO the robot, represents human aspirations for a better future (specifically through technology). SICO wants to be helpful and tends to be optimistic." The script is designed as a flow chart. There are narrative modules and interactive loops, where SICO will have a range of responses based on what audience members actually say. The script resembles the interactions of a computer program, but includes deliberate "errors", which will be both ludicrous and a little sinister. In this sense, audience members will be encouraged to project their own sense of personality on this "helpful" and defective machine.